What can you say? Another enjoyable, accessible puzzle from Dac. I started at a gallop in the NW corner and filled maybe three quarters of the grid pretty quickly, but the rest took as long again. Perhaps it was deciding that the pudding was the definition bit in 22d, or confidently (mis)spelling the African lake as per an old Doctor Who companion that could be derived from the same anagram fodder, or the number of very well disguised definitions throughout. Talking of which, 15ac was rather sneaky… I would blame the error in the enumeration at 11/12, but because I spotted it straight away I can’t. Overall time anyway under par for the i, and about par for Dac. COD? My last in, and if only because it took an age to work out which bits were the definition and which the wordplay, 7d – “Film director missing start of sad Spielberg movie (5)”. Harribobs’ Captain’s Log was voted best Inquisitor of 2016-7. A very worthy winner, so expectations are running high. No pressure. 😉 What do we have today? The preamble? Let’s just say that together with the way those clues are grouped an inner turmoil is exactly what I’m left feeling, and not in a good way. If we don’t have our work cut out solving the clues we’ll be hard pressed knowing what to do with them afterwards. Backwards, forwards, cycled, completely random. Yikes. Extra words in some clues lead to an instruction. Something to highlight at the end. “Advice – use a pencil!” You bet I will. The clues. Well, a garden in Saint is pretty obviously SEDENT at 10dn, with “Andrews” as an extra word, and some of the cycled clues are pretty doable, but that list of jumbled clues is pretty extensive, and without knowing where the letters go progress is inevitably slow. The extra words? Well, I’ve got them, and without too much in the way of wailing and gnashing of teeth. A few checking letters here and there by applying a bit of logic. 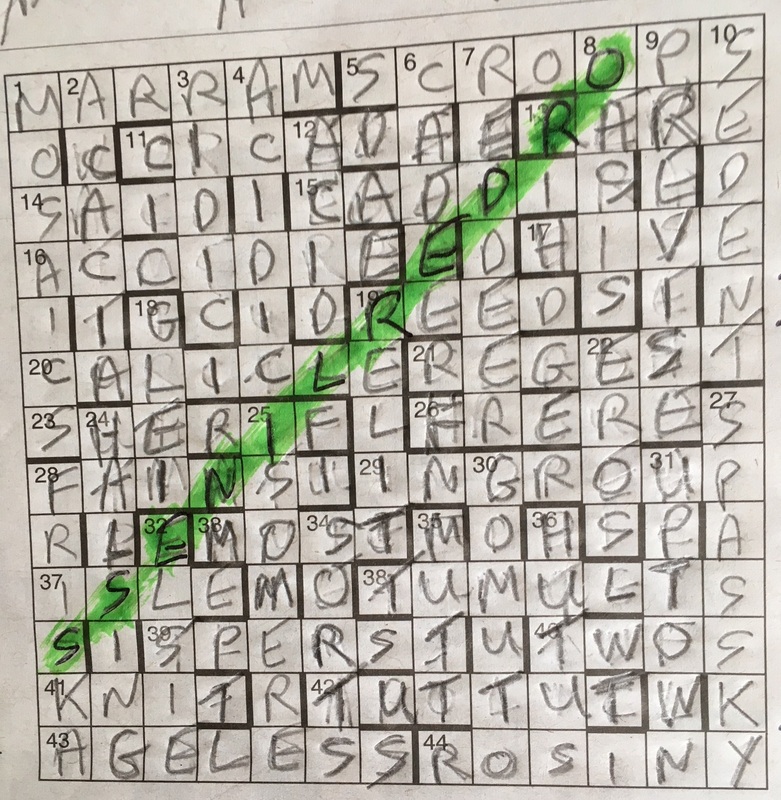 The elusive 1ac – MARRAM – which should have been one of the easy ones – it’s one of the normal clues – but takes a word search and a bit of reverse engineering with the wordplay. Last in? 15ac, which must be EGERIA (with NI as the insurance, which took far too long to work out) but won’t fit. Because as it becomes clear – an hour later – my logic was flawed. All of which sounds like a steady, pretty reasonable process in retrospect. But in fact took two days, off and on. I can’t remember the rating system for Inquisitor difficulty but Harribobs’s turned it up to 11. What does the message from the extra words tell us (with Excel at hand to sort the answers)? Now this is where it gets scary. Armed only with a ruler, a rubber, and a pencil that’s a lot more blunt than when we started, off we go, as we’re instructed, sorting the letters in each NW-SE diagonal. Now we’ll find out if our answers are correct, with reference now and then to the BRB. No room for error. And having to erase most of that painstakingly filled out grid. Inquisitor solvers the country wide weep silently into their cups of tea – or is it something a bit stronger at this point? As it turns out I only messed up once as far as I can tell, forgetting the W in 20ac, the quite marvellous TWOCCER. Lucky I took a snap of the grid before I started rubbing most of it out. Now we’ve got a grid full of real words rather than the mess there was before. The first truly testing Tuesday puzzle of 2018 in my opinion – the more so if you only saw the TV programme around which it is themed a couple of times, back in 1980-something. Furious ransacking of dim and distant memories was the order of the day here, and it’s only with the help of RatkojaRiku’s excellent September 2013 Fifteensquared blog entry that I now realise the significance of 19/21. A super puzzle completed without recourse to references (always a good sign … mind you I did check that pigeon in Chambers afterwards), but definitely a stiff challenge. Reading through the comments on the other side, one gets the feeling that some of the mighty were feeling ever-so-slightly humbled … or should have been. There was a certain grumpiness in the air. I have no complaints anyway, and far too many ticks to try the readers’ patience with a run through of my favourites. My Clue Of The Day, 4d, contains a device described as “outrageous”, which is why I’ve chosen it. “Amusingly cheeky” will do for me. “Clean break by woman originally reported married (6)”. The Don’s back with his fairly regular gentle introduction to the working week, with a few new words learnt, and a couple that were a little trickier. Of the latter 21ac was perhaps particularly so if you don’t know a great deal about cricket, as is the case here. A few went in on definition alone, and for a few there was no chance of doing so, so a nicely varied set of clues. Overall a little above par for Quixote, but well under for the i. Perhaps we’re in for an easier time this week? COD? With 26ac a close second, I’m going with 21ac which in retrospect is very nicely done – “Pom batting to get one century after another? (7)”. One of Phi’s best in weeks – I had 7 ticks plus 3 double ticks in the margins and just a bit of a pickle at the end on the intersection of Megohm and Sleigh bell which, in common with the blogger over at Fifteensquared here, I initially wanted to be Megoer and Alpine bell. One commenter there questioned the word Planetaria but I would trust Phi on that because he’s an astronomer. Is there a theme or Nina? Given that this is Phi and given that the grid does strongly suggest it, it’s probably worth looking. The peripheral unches have Sam, Ham, Vam and Yam in, but I fail to see any significance in that… Wait a minute, Google points to Lam Vam Ram Yam Ham Om being ‘the sound of the chakras’, and there’s Om in column 13… and Lam on the diagonal coming from the NE! Is that it? Completely far-fetched and un-Phi-like of course but, with no enlightenment from the other channel, it’s the best I can come up with! It’s Monk, and it’s a Saturday reprint, so it’s on the tough side to say the least. To be fair I managed most of this in pretty good time, feeling somewhat pleased with myself when I got some of the more obscure answers – LOUCHELY and CHACE for example – but came a little unstuck at the close on 5ac, 7d, 21d and 20d. Throughout the wordplay was pretty fair, so no complaints. Oh, apart from the great big obscurity in 13ac (Mr BATT) that left me unsure of an answer I was only 90% sure was correct in a corner of the grid I was struggling with. 18d and 22d I suspect may have offended one or two solvers today. COD? 1ac – “Source of lies that hurts a clergyman’s office in a sinister way (8)”. After yesterday’s travails, something a little more straightforward to ease us through mid-week? Well, not quite. Today’s puzzle is one of those rare Dacs that left me scratching my head in more than one place, with very little falling particularly easily. I didn’t know the Swiss location or the actress, but managed to guess both correctly. Didn’t / couldn’t fully parse 3d or 16ac either, but got away with both. The latter for me will always be known as An Hour Too Far after my father decided that the perfect day out during one particularly memorable childhood holiday would be to go and see 16ac at the local cinema. Tough, grim, gritty war movies have their place, but this wasn’t one of them. Was Dac going for a pangram today, only to change his mind halfway through? Who can tell. COD? Lots of ticks as ever on a Wednesday, along with the usual smooth surfaces, with my vote going to 14ac – “Who might be unearthing rubbish on counter? (7-6)”. A suspiciously short preamble this week – a message (what message?) relating to two unclued entries points to a significant achievement. What are we supposed to do about it? Who can tell. Chalicea to date has been pretty much on the easy side, so perhaps we shouldn’t be looking for something too devilish. Time will tell. To the grid. And easy, very easy clues. Ag at home gives us 1ac, a hidden clue at 2d, a pretty screaming out loud definition at 1d… You get the picture. I had this grid filled in almost as quickly as I did the same day’s Phi. Not that I’m complaining, I’m pretty rubbish at these things and can do with the odd ego-massage now and then. And those two unclued entries? 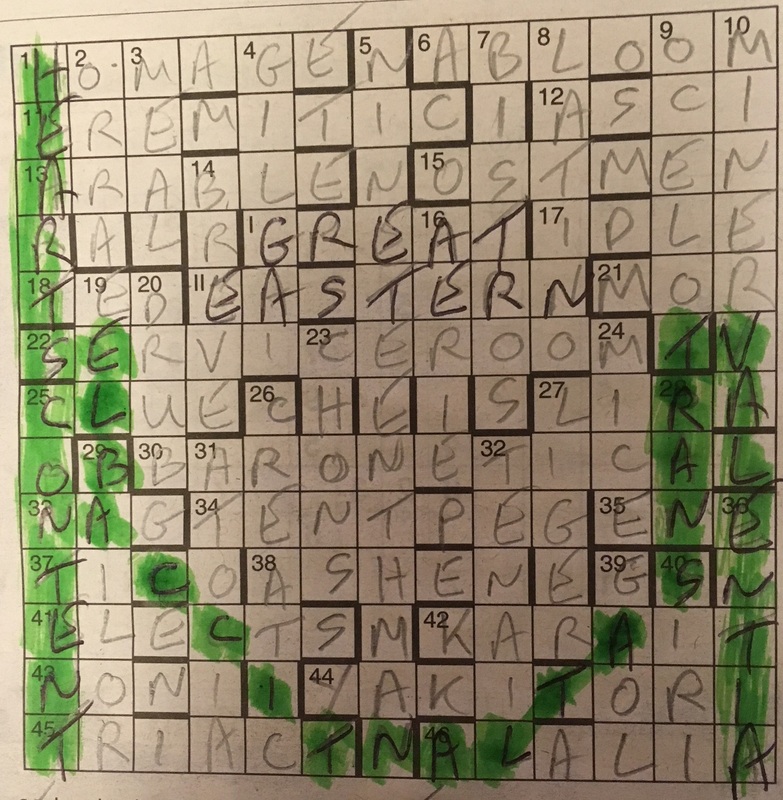 Very obviously GREAT and EASTERN. The railway? Cue the QI klaxon. Shade thirty nine cells to show first laid by unclued light. Look for a bit longer. Google “Great Eastern first laid”, and it appears that we’re looking at the first transatlantic cable line, that was indeed partly laid by the refitted Great Eastern. So what are the two places we’re looking for? Presumably where the cable went to and from – VALENTIA Island in Ireland to HEART’S CONTENT in Newfoundland, which are indeed on the east and west of the grid respectively. What joins them? Well, that transatlantic cable, which I suppose very loosely is an agent and object. Sort of. If you squint. How long did it take me to find it? Far too long, and only after I’d realised that I’d got 37ac wrong, with an R where the C for cable should have been. Scorpion: lucky me. Always a pleasure to find out what he’s come up with, so let’s see: no sign of interlinked clues but there are plenty of peripheral unches, so it’s going to be Nina, right? Wrong. As will become apparent, a certain word just keeps on cropping up throughout the puzzle. I don’t recall seeing this particular sort of gimmick before, but it’s an entertaining one and nicely done too. By the by, it’s worth a glance at the comments on the other side because there was a brief outbreak of hilarity. Nothing tasteful you understand, but amusing nonetheless.